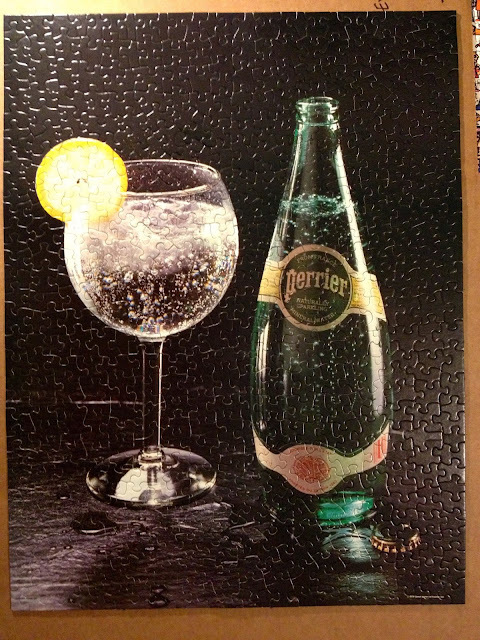 While I was waiting for M so we could finish Rizzi yesterday, I fired up the Effervescently Yours puzzle (The one showing the Perrier bottle) that she picked up from the Thrift store. It is a springbox puzzle from 70s or 80s and it was a joy to put together! I was worried with all of the black pieces, but the Springbox cutting technique results in pieces with clear shape differentiation and I was able to assemble the entire puzzle without a mistake! I am glad to report that our perfect record at getting puzzles from thrift stores that have all the pieces has gone untarnished! I really enjoy these Springbox puzzles and puzzles in general with the funky shapes that dont follow the grid patters of cutting. It makes for interesting puzzling! I just wish they would all go back to including a signature piece. Without further delay: Effervescently Yours! Notes: Love the unique pieces and how tight they fit together. I picked up the puzzle by the edge and shook it to show M how tight it was!! !